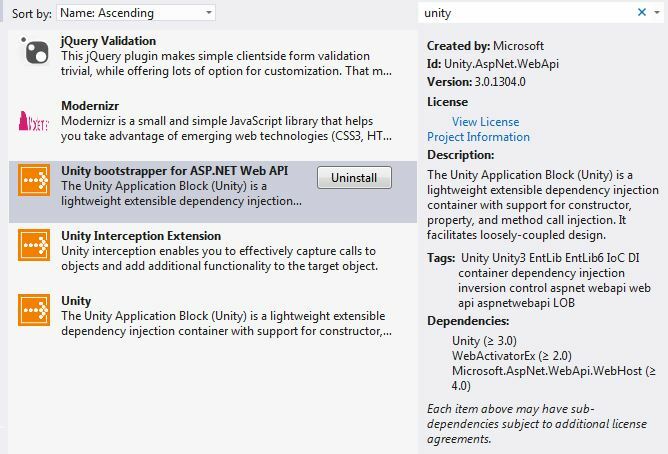 This blog demonstrates the usage of filters and unity interface interception with an ASP.NET Web Api application. AOP = Aspect oriented programming. This programming paradigm can be used to add functionality to existing methods. In the following example, we wrap the controller method with diagnosis using filters and then we wrap the business manager with diagnosis using unity interception (interface). Create a EventSource class. These will be used to log the events. NOTE: The ActionFilterAttribute is not the same for MVC and Web Api! If used for all controllers, it must be added in the filter list. The class has also different methods. You can see that the 2 namespaces are different. When using Web Api, care must be taken to use the right one. You don’t have to use these, but then you must implement all the filter logic yourself. Now lets add AOP for the backend. We use unity in this example. Now any class marked with the RequestReponseAttribute will be logged before and after. Thank you for this tutorial. Can I also use autofac and log4net to do it?